Here's a long view of the swatch. 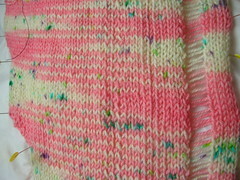 Looking at it with the stitches dropped I think I like the pooled areas as well as or better than the stripes. The truth is I like the white flecked color better than the pink and if it isn't pooled it gets sort of lost between stripes of pink. Sigh. Well, then I'll just let it pool when it wills. Also I just realized that the 43 stitch width would not be the width of the scarf and instead the width of the bias, making the scarf narrower than I was thinking 43 stitches would give me. Since I like the pooled and the striped sections, I think I will be ok just increasing to the width I'd like and letting it pool and stripe where it will. So much for swatching to figure out the colorway. I have frogged this quite substantial swatch now so that I can get as much length as possible for the scarf. Ready to cast on! Here are the 3 ladders which carried through the whole swatch. 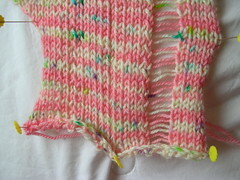 For the outside two, I knit through the back loop and purled on the back side. 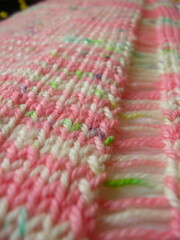 For the middle ladder, I knit through the back loop on the front and purled through the back loop on the back. 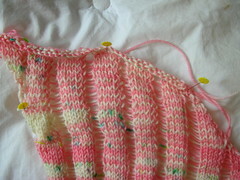 I think I will purl through the back loop for the framing stitches since it really does neaten up the ladder edges. Here are 2 sections of swatch. First there is a 49 stitch section, this was too wide for the color sections so I bound off 6 to 43 stitches and then started swatching on the bias. Two rows down from the needle here I adjusted the yarn to start the color at the beginning of the row. 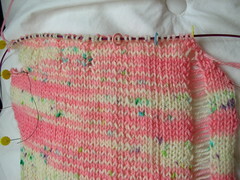 So far this is causing a 1 row striping effect, pink then white which travels nicely on the bias. 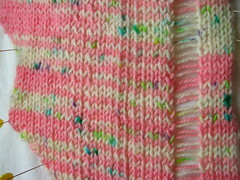 This is the 43 stitch section and is the width I'm looking at because there are about 41-43 stitches per color. I just need to adjust the color to the beginning of the row. But I wonder about travelling on the bias if the stripes would travel too. At 25 Stitches, section 1 is about 4.5 inches wide with the stitches dropped (3 ladders). I like how each half of the colorway has two rows of stitches. This is my favorite effect of the swatch but I fear too narrow for my scarf. Next stop, 31 stitches. 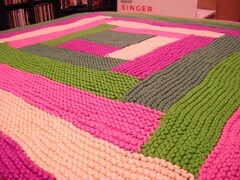 Ok, so everyone, and I really mean everyone, has knit this fabulous pattern from knitty.com. I've just been waiting til the time is right. I did research about yarn and modifications and decided to marry 2 goals and use my Violet's Pink Ribbon Yarn to make a Clapotis narrow scarf. I bought this sport weight yarn from Lisa Souza to assist the hilarious Miss V in times of trouble, but didn't have any plans for it. When I began to think about maybe making some plans, I checked out photos of what other people were making. And... I wasn't crazy about it. Narrower items just looked pink and splotchy to me and wider items had odd pooling. Most people had ordered it in a sock weight and there were many socks. I ordered it in sport because I knew I was not going to be making socks. There were a variety of non-sock projects as well, but I just couldn't imagine making anything I would actually wear, since I am mostly not a pink-wearer. So I left it in the stash. 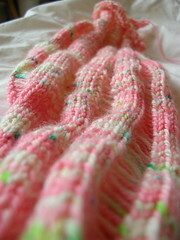 I looked and looked at the yarn in its permutations and decided that it might work as a nice springy holey scarf. But serious swatching would be necessary to decide how the colorway would work best. 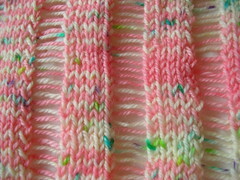 So I found the tips on Needles & Hooks blog and began with a 25 stitch swatch. The following posts will follow my various experiments in the swatch. So far, I really like the colorway. It is so pretty to knit with, I just want to find the perfect match for it to look as pretty in a knitted fabric. It is like knitting with easter bunny yarn. Perfect for right now. Pattern: Made it up based on countless tutorials on magic loop knitting and then cables based on whimsy. Increases for abandoned calf shaping the same. Yarn: Lisa Souza Merino Sport in Delft. I wanted to learn the magic loop technique so I cast these on last spring. Since I just finished them, you can imagine there was a gap in there. I love doing 2 at once, because I can imagine never finishing the second. I appreciate the elegance of the technique as well, but I just don't think I'm a sock knitter. I like the socks, but I like faster knits. Since I'm limited to knitting on the subway, which is a time as well as project size limitation, I think I enjoy quick accessory type knits most, since I like to spend no more than 2 weeks on a project. I do spend longer but I get bored after about 2 weeks of the same. I was originally going to knit until the yarn ran out but decided I'd had enough even though I'd started the calf shaping to make a knee sock. I think I would have made it too with 875 yards of sport weight. 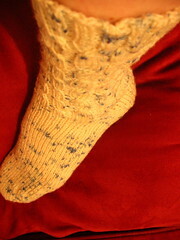 I think I will use the remainder to design a socklet pattern. I like the pretty blue flecky color of these but I think they are too thick to wear with shoes, so they will be house socks. Thus, they will be seen more often. Verdict: Magic loop is neat, socks are nowhere to be found in my alley.